3M Cool Flow valve effectively reduces expiratory resistance, heat and moisture accumulation to improve comfort. 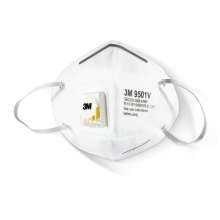 Perfect for non-oily particulate matter, such as PM2.5, pollen, dust. The filtration efficiency is more than 95%. 3D cutting, perfectly fit your face. Soft inner material, comfortable to wear. Adjustable nose clip and two elastic fastening straps create a secure seal for maximum protection. 25 pcs individual packing, clean and sanitary, easy to use and share.